The 45 straight is a sturdier production tube we make as an introductory tube. The 5mm thick glass is about as much strength you can find in a non 9mm design. The beaded, thick foot gives abnormal stability and life to this borosilicate bombshell. 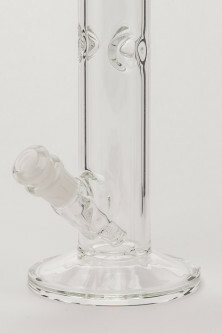 The open diffused downstem ensures no drag or clog. Perfect for everyone, ready for anything, afraid of nothing.